The global proliferation of jellyfish is coming to your shores, if they are not there already. It is only a matter of time as the current marine environment has developed the perfect cauldron for the venomous invertebrates. Ocean Care Solutions knows of the onslaught and has developed products that are among the nominees for the 2012 World Open Water Swimming Offering of the Year . The new award is meant to identify products and services that (1) best support and assist open water swimmers achieve their goals, (2) are innovative, unique and beneficial to open water swimmers, race directors, coaches or administrators, and (3) have made the most positive impact on the world of open water swimming during the calendar year. The nominations are meant to recognize some of the best and innovative commercial and free offerings that open water swimmers can enjoy. Extreme swimmers, disabled swimmers, ice swimmers, marathon swimmers, professional swimmers, administrators, coaches, pilots, and swimmers from all walks of life have used, purchased and benefited from an increasingly number of products and services introduced over the few years. "Care is its middle name. 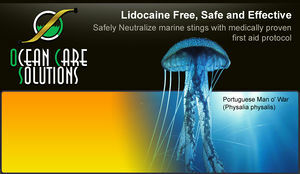 Ocean Care Solutions is working hard to help stem the tide of the pain and discomfort caused by stinging organisms. Its products enable comforting relief from a number of jellyfish, Portuguese man o war, sea urchins, fire coral and stingrays. And Ocean Care Solutions goes beyond supplying a wide range of first aid kits that are widely acclaimed the world over. It provides information, a constant source of education about the global proliferation of jellyfish in the world's oceans. For its desire to relief pain by working directly with the stakeholders in the open water swimming world, for its wide range of soothing solutions, for its sharing of information about the sea stingers that are a growing menace in the aquatic world, the Ocean Care Solutions line-up is a worthy nominee for the 2012 WOWSA Open Water Swimming Offering of the Year." Online voting will take place here at WOWSA until December 31st. Ocean Care Solutions, founded by Kevin Freeman, is a company specializing in the development, distribution and sales of marine life first aid kit. Its products have been designed to meet medical and marine science first aid protocols for these animal stings specific to each injury. Its easy-to-use kits, complete with everything necessary to effectively treat an injury, sets a new standard in marine sting treatment for the consumer.